The code commences on 1 January 2012. The code offers advice to persons conducting a business or undertaking that provides recreational diving, recreational technical diving and snorkelling and others, and to the persons for whom recreational diving, recreational technical diving and snorkelling are provided, on how they can make recreational diving, recreational technical diving and snorkelling a healthier and safer activity. Please see the full document Code of Practice for Recreational Diving and Snorkelling. The Australian Underwater Federation (AUF) is responsible for "Bringing sport, conservation and awareness to the underwater world" and we are delighted with a recent grant from the Queensland Government to increase the safety of spearfishers, skindivers and snorkellors in Queensland waters. Luke Randall is Queensland Chair of the AUF Spearfishing Commission and has survived a serious accident of being run?over by a boat while spearfishing at the Gold Coast in 2006. "I am fortunate to have survived a nasty accident and pleased that this grant will improve safety forother spearfishers and snorkellors as this grant will make a huge difference to improving safety training and communication" said MrRandall. A national "Spear Safe" committee has been set up to increase safety of spearfishing and freediving and the focus of this committee includesregular meetings, articles, DVD, website, risk assessment, stickers. "I am pleased that the Queensland AUF will work closely with ournational, NSW, Vic, SA and WA volunteers to make a positive difference" said Mr Randall.
" I delighted that the Queensland Government has recognised the importance role of the AUF Queensland and our vision and commitmentto improve safety for all participants. The review of training modules will focus on spearfishing and snorkelling but will also include otherunderwater sports played in swimming pools such as Underwater hockey" said Judy Breeze, Executive Director, AUF Queensland. DIVERS from around the world descend on Ningaloo Reef to see one creature – the giant whale shark. This long fringing reef off the north coast of Western Australia is world famous for these gentle giants. However, after a week of diving this area I learnt that there was much more to Ningaloo Reef than just whale sharks. The Ningaloo Reef Marine Park is one of the richest marine environments in Australia, stretching over 260km along the rugged desert coastline of North West Cape. Scuba diving and snorkelling on Ningaloo Reef is possible from Coral Bay at the southern end of the reef and Exmouth in the north. Exmouth is a sleepy little town that was once better known for being the location for a top secret US naval communication base. The base still dominates the landscape with an array of giant antennas towering above the desert. Since the Australian Government took control of the communication base tourism has become the lifeblood of Exmouth. Exmouth does have some good accommodation, but if it weren't for Ningaloo Reef and the Cape Range National Park most people would have little reason for visiting the town. When I arrived in Exmouth in April, at the end of the cyclone season, the town had just experienced two close misses. I headed to the Exmouth Diving Centre and spoke with the owner Kristin Anderson, who informed me that they were still diving. The next morning found me heading out to dive the Muiron Islands. 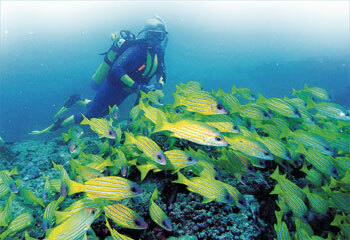 The Exmouth Diving Centre offers dive course, equipment hire and daily boat dives. It operates two large and very comfortable dive boats, one to the whale sharks and the other to Ningaloo Reef and Muiron Islands. The Muiron Islands are located north of Ningaloo Reef and are actually outside the marine park. A nesting site for turtles, the islands are surrounded by lovely coral reefs. It takes more than an hour to reach them from the Exmouth Boat Harbour. I did two wonderful dives at the Muiron Islands, exploring a rocky reef covered in colourful coral and with abundant tropical marine life. The water temperature was a very warm 27C and the water was quite clear considering the recent cyclone activity. I was interested to compare Ningaloo Reef diving with the Great Barrier Reef and was amazed by the variety and number of reef and pelagic fishes. More than 500 fish species have been identified in the area. This was no poor cousin to the Great Barrier Reef. The following day was whale sharking. At the start of the whale shark season, which runs from late March to the end of July, the sharks can be a bit timid. For the previous few days the Exmouth Diving Centre hadn't been able to get snorkellers in the water with any whale sharks. Fortunately, they have a policy that you can return for a free trip if no whale sharks are seen. The day started with a scuba dive on the outer edge of Ningaloo Reef at a site called Three Fins. The reef here was very pretty, lots of coral and a multitude of reef fish. It was then time to search for whale sharks, but it was to be a frustrating search today. A few sharks were seen and one boat even got some snorkellers in with one shark. However, the sharks kept diving and were not interested in playing today. Throughout the day the water all around us was boiling with fish and birds, so there was no shortage of action. We even briefly snorkelled with a large manta ray. One of the features of diving off Exmouth is the variety of dive sites. Exploring Lighthouse Bay the next day, which is actually inside the reef at the top of North West Cape, the diving is completely different from Ningaloo Reef. The bottom in Lighthouse Bay is sandy and cut by limestone ridges, not much coral growth, but fantastic marine life. I dived two sites here, Blizzard Ridge and Gulliver's and was just amazed by the marine life. Reef sharks, wobbegongs, gropers, lionfish, stingrays, sea snakes and masses of reef fish. You could spend all your time scuba diving and snorkelling while in Exmouth, but there are a few other attractions, including the Cape Range National Park. The range dominates North West Cape, rising 300m above the surrounding desert. I spend a morning exploring the park, which was an unforgettable experience, the range being an ancient place with colourful canyons and incredible rock formations. In the afternoon I was booked to do Exmouth's most famous dive site, the Navy Pier, which has been rated as one of the best dive sites in the world. The pier is used to supply the nearby Harold E. Holt Naval Communication Station and is off limits to the public, however Exmouth Diving Centre has arranged special permission to take divers to marvel at all the marine life under the pier. The action started as soon as I jumped in the water, with a school of big eye trevally swarming around me as I descended. Swimming between a forest of steel pylons there were masses of fish to be seen. For the next hour I moved slowly from pylon to pylon, photographing estuary gropers, moray eels, lionfish, wobbegongs, reef sharks and a huge Queensland groper. On my final day of diving I had one more chance with the whale sharks. We first had a dive at Central Station, another wonderful reef dive. I saw several white tip reef sharks and two large loggerhead turtles. On the way back to the boat we heard the diver recall signal. A whale shark had been spotted. One of the other boats was already with the shark, but the operators work together to share the whale sharks, so we waited nearby for our turn. The Department of Conservation and Land Management have set strict guidelines for snorkelling with whale sharks to ensure that the sharks are not interfered with and that you get a long interaction time. I got my snorkelling gear ready and waited patiently. Then it was go, go, go! We piled into the water and swam over to the spotter as quickly as possible, staring into the water for a view of the shark. Then it suddenly appeared, swimming straight towards us, a gentle giant, or rather a small gentle giant, as the shark was only about 4m long. Whale sharks, the largest fish in the ocean, can reach 12m in length and feed on tiny plankton. As the shark swam past I started to swim beside it, clicking off photos. I was soon kicking very hard to keep up. I only had five minutes with the shark, but it was a thrilling experience and very exhausting. For the next few hours we had five more swims with this and another small whale shark. I slept well that night, exhausted after a sensational day with Ningaloo's whale sharks.